If imitation is the sincerest form of flattery, Marvel and Disney should feel pretty good right about now. Why? Well, because of the success of Marvel’s The Avengers, Warner Bros has decided to move forward (again) with its long gestating Justice League movie. Now before you get too excited, they’ve only hired a writer. Although, that’s a great first step considering movies just don’t spontaneously happen by themselves with actors making up their lines on the day (regardless of what actors tell you). The latest writer to take on the Justice League is Will Beall, who wrote the studios Gangster Squad movie that’s coming out soon. Apparently, because that’s an enseamble piece about a group of gangsters, the studio feels it qualifies Beall to write a Justice League movie? Sure, why not? In fact, Warner Bros. must really love Beall because he’s also writitng their Lethal Weapon reboot and the reboot of Logan’s Run. He must never sleep. Of course, we’ll be following this as it develops. In the meantime, look for a Justice League movie sometime in the future. It’s pretty much inevitable it will get made. It’s just a matter of time. Even though Warner Bros. Interactive Entertainment didn’t make the big announcement about Batman: Arkham City until after Comic Con, they did make sure to let us get our hands on a more kid friendly Batman title. Based off the animated series of the same name, Batman: The Brave and The Bold, which is coming to both the Wii and Nintendo DS, takes classic 2D side scrolling gameplay mixed with hand drawn animations to present a mix of modern and retro to the screen. 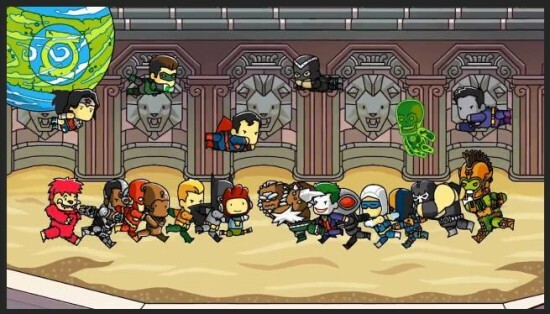 Each level is built as a cooperative experience pairing up Batman with either Robin, Aquaman, Black Canary, Blue Beetle, Captain Marvel, Green Lantern Guy Gardner, Green Arrow, Hawkman, Green Lantern Hal Jordan, Plastic Man or the Red Tornado facing off against the schemes of any of the game’s various villains. These villains include Catman, Catwoman, Gorilla Grodd, Mongul, Starro and Two-Face. Like the comic book and the show, Batman: The Brave and The Bold focuses on the idea of Batman teaming up with another hero to take on some villainous force he would not have been able to take on solo. Each level features a different hero and drop-in, drop-out gameplay allowing for players to hop in even mid-level. The game contains a full five minutes of original animation created by WB Animation, the same team that works on the Batman: The Brave and The Bold series. These are seen throughout any of the game’s 2D cutscenes. Everything in the game is hand drawn before being digitally scanned and then animated. Because of this production style, the game contains around 15,000 individual animations. The game definitely stands out amongst all of the other 3D computer animated titles currently being shown.